This special anniversary edition tambour mantel clock features decorative top molding and triangular burl overlays. Finished in Windsor Cherry on select hardwoods and veneers. 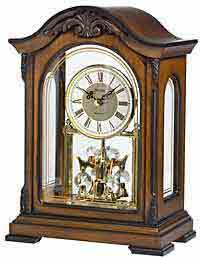 Quartz, triple chime Harmonic movement plays your choice of quarter hour or hourly Westminster Chime and Ave Maria, or Bim Bam chimes with volume control and automatic nighttime chime shut-off switch and features volume control. Automatic nighttime chime shut-off between 10:00 pm and 7:15 am. 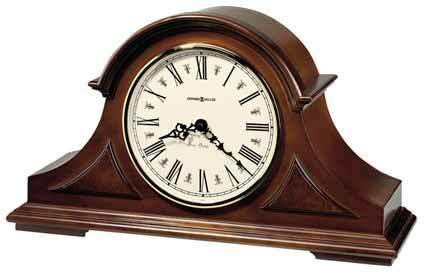 Clocks for sale at The Clock Depot including the 635-107 at discount prices.